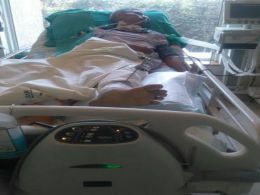 Campaign - Pls HMy Father met with SERIOUS ACCIDENT! Pls HMy Father met with SERIOUS ACCIDENT! My name is Swati Tyagi. We stay in GovindApuram, Ghaziabad, UP. My father met with a serious road accident, in which he has got a major leg and brain injuries. He is in the ICU since last 15 days. He is been treated in Max hospital Parpargang. I have paid the initial bills till now. But due to shortage of money with me, his treatment has been discontinued.We are a family of five people and he is the only earning person and his employer is not able to help us also. So, I request everyone to help me by supporting me. Hospital has given us an estimate of Rs 11-12 lakh to save my father. I need your help in saving him. Whatever contribution you can please do, I request you to help me. 1. If you can please transfer Rs 3,575 amount. In this case, please fill all your details here https://www.onlinesensor.com/join/swatityagi1988I have chosen this platform because of one specific reason. This way you will get a chance to CREATE your own Campaign of any Amount for any of your need, at anytime you will also need it. Once you register >> Login with your credentials (which you'll get during registration on https://www.onlinesensor.com/join/swatityagi1988 ) . Then ,(on left side) click on "CONTRIBUTION" tab. Then click on "Donate/Contribute". Then , go to bottom of page and do two transactions i.e one of Rs 325 and Rs 3250. I shall be extremely thankful for your contribution towards my campaign and it will surely help me make my Father live a better life after the treatment. Do not hesitate to call me at 9873150906 for any details regarding my personal campaign.Seeking your support and active participation. Seeking your support and active participation. Share this widget on your site or blog by copying and pasting the code above. All payments are final and cannot be refunded. Please donate only to the people you know. If you feel this contains prohibited content . Your question is about this campaign . Please use your email address. Let your friends know about this campaign by sending them an email. Simply enter their name and email ID below..
Legal Disclaimer: Please note that all the content uploaded in any of the campaign belongs to the campaign owner and company hold's no responsibility to verify the facts or figures or copyrights of any of the contents published in any of the campaigns. Company only verifies the contact details and does a basic KYC of the campaign owner as is required by local laws of the land of various countries, since financial transactions are involved. It's a sole responsibility of the campaign owner to ensure that the campaign does not break any laws of the land from where the campaign is originating and also follows the local tax and legal regulations. We encourage our campaign owners to keep a track of the donations or contributions received and to also verify the source of income of the larger contributions. Please also note that company does not offer any benefits or monetary gains to any of the contributors and if at all any rewards or benefits have been offered in any of the campaigns, the campaign owners shall honor the same on their own responsibility. Company plays no role in disbursement of any kind of benefits or rewards to the contributors. We encourage the contributors and donors to be extremely vigilant while contributing and report to us in case they find anything wrong or unethical or not as per the local rules and regulations. Company would, from time to time, audit the campaigns and fund raising activities via various third party auditors and reserves the right to remove or pause any of the campaigns found indulging in unlawful or illegal activities or any other activities which may harm company's brand image in any way whatsoever. The campaign owner shall abide by the company's decision, which shall be final at all times. 2000-17 © OnlineSensor.com All Rights Reserved.